I am excited to tell y’all about the annual Eggland’s Best “America’s Best Recipe” Contest that is going on right now. 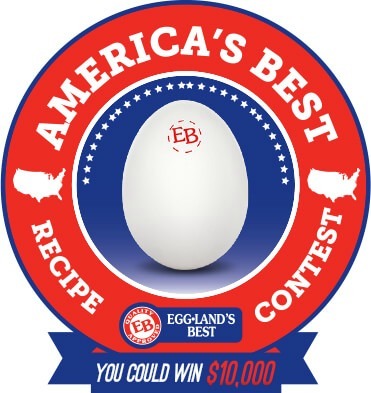 Until April 29, Eggland’s Best will be accepting entries for “America’s Best Recipe” Contest on the Eggland’s Best website. One Grand Prize winner will receive $10,000 and a year’s supply of Eggland’s Best eggs! Pretty sweet, plus, additional prizes will be awarded to Best in Region and Best in State! I was provided with Eggland’s Best information, coupons, and a small gift card, to cover recipe ingredients by Eggland’s Best. I love eggs year round but in the spring, my mind turns to hard boiled eggs so I’m going to enter my Pimento Cheese Deviled Eggs Recipe. You can visit the Eggland’s Best website to find more information about the Eggland’s Best “America’s Best Recipe” Contest and enter at: https://www.americasbestrecipe.com/contest. I am excited to enter myself and I have been coming up with some fun ideas for a recipe that incorporates both EB eggs and regional favorite ingredients. 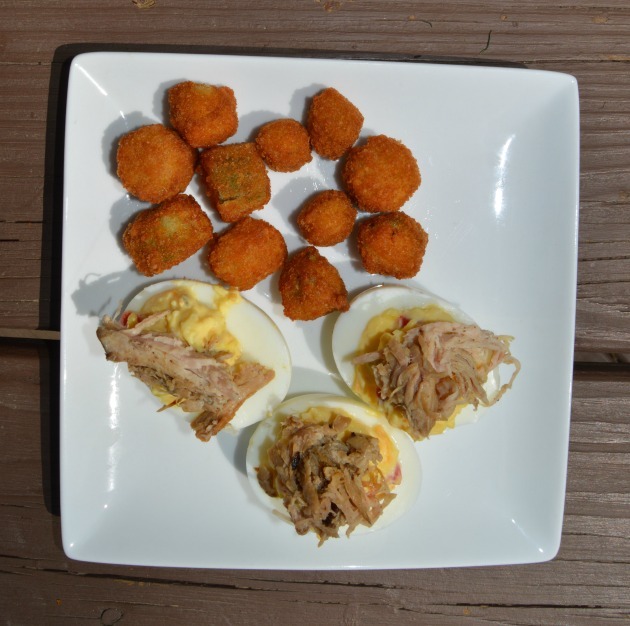 I live in Nashville so I decided to represent with some local favs- pimiento cheese, deviled eggs, and pulled pork. 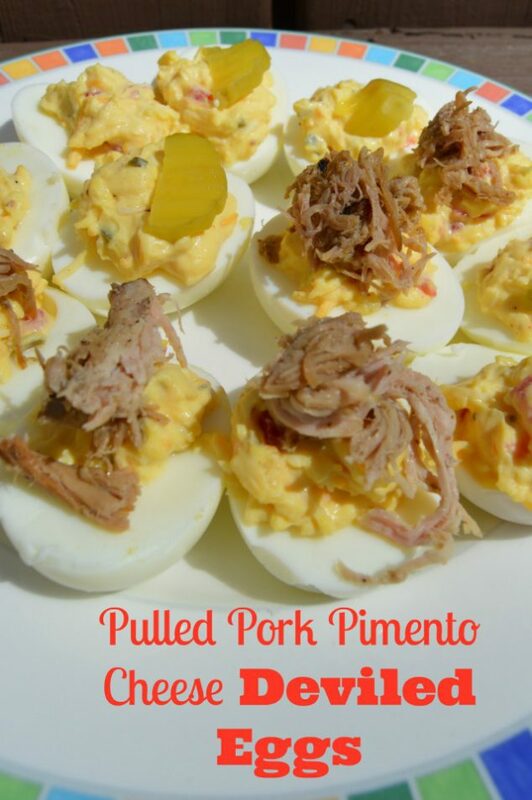 I rolled those all up into one to present you with Pulled Pork Pimento Cheese Deviled Eggs. Now if that isn’t Southern, I don’t know what is! How will you integrate a locally-sourced ingredient to show your state or regional pride? I grew up eating farm fresh eggs that my grandmother raised and I appreciate a good egg. I can see the difference and taste the difference in the yolk. Compared to ordinary eggs, each Eggland’s Best egg offers four times more vitamin D, more than double the omega-3s, and contains 25% less saturated fat. Fill a large pan part way with water. Add your eggs slowly and carefully so as not to crack them. Make sure the water covers the eggs and then place on the stove over medium high heat until they come to a boil. Turn off and allow to sit covered for 12 minutes. Your eggs should now be hard boiled. Pour off the hot water and fill the pan with cool ice water and peel the eggs right away running under cool water if they are hot. 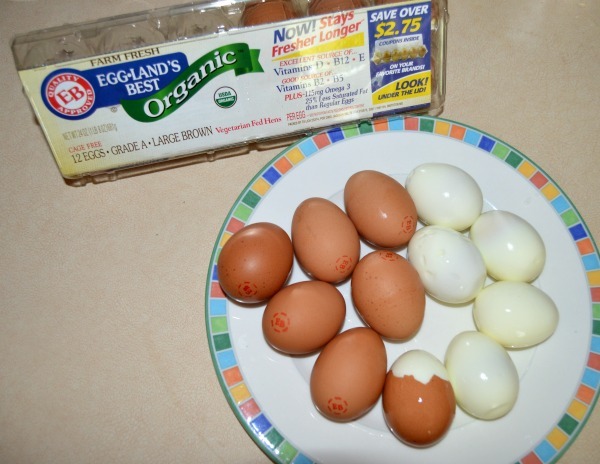 Slice the eggs in half, lengthwise. Pop all the yolks out into a bowl and add mayo and lemon juice. Stir until smooth. Now add in the sweet relish, diced pimento, and shredded cheese. Stir until smooth. Add the salt, pepper and cayenne and then taste to see if it suits you or if you need a bit more of any of them. Spoon the deviled filling back into the egg halves. Now you garnish with the bread and butter pickle and sprinkle with paprika. You could be done there or you could go ahead and add some pulled pork on top. Delish! Then serve them up with some fried okra or some biscuits or some cornbread! 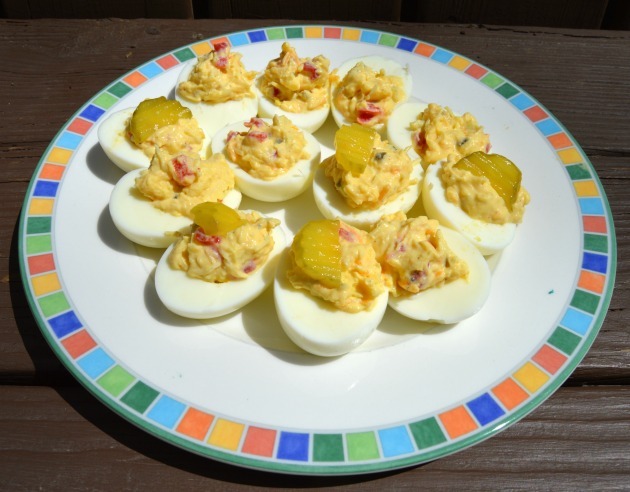 Do you think you will try this Pimento Cheese Deviled Eggs Recipe? Will you top them with pulled pork? Are you going to enter Eggland’s Best America’s Best Recipe Contest? What are you thinking of making with eggs to wow the judges? I love ham and cheese omelette. I like to make my Bacon, cheddar cheese, olives, mushrooms omelets! My favorite would have to be my French Silk Pie! I love to make homemade vanilla pudding with the freshest milk, the best vanilla and the freshest, best eggs- Eggland’s! When a recipe is that simple, it is the quality of the ingredients that makes it really good, and that is perfect for Eggland’s! I love scrambled eggs with cheese and ham. I like to make a sausage and egg casserole. My favorite recipe to make with eggs is a cheese, broccoli, tomato, and mushroom omelet! I love to make monster cookies. Not egg based but you do use eggs! I like mushroom and cheese omelettes. I love a classic fried egg sandwich. My all time favorite recipe using eggs is chocolate cake!!! I’m also a big omelet fan. my favorite recipe with eggs is egg salad. I love mushroom and spinach omelets! I love making a noodle kugel with apples, raisins, and egg custard! My favorite is making a spicy egg salad. I like making deviled eggs. We love egg and bacon with spinach casserole! I love to make steak and egg for my husband on sunday mornings. My two favorite recipes are Bacon-Deviled Eggs & fried egg sandwich! Bacon eggs mushrooms and cheese scramble is my favorite thing to eat with eggs. My grandmother’s recipe for sausage spinach quiche. Deviled eggs are my favorite egg! I like to make omelets, with bacon and mushrooms, plus lots of cheese. 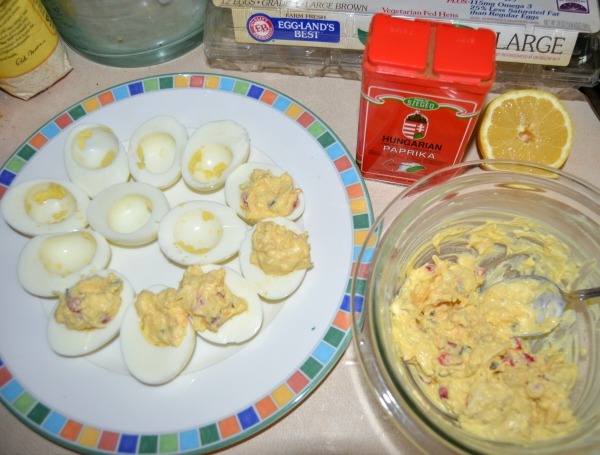 My favorite recipe with eggs is deviled eggs…in fact I think I need to make some today! Sounds so good! I love to add a fried egg to hamburgers and my grandkids like birds nest toast. Western Omelets are my favorite. My favorite is a mushroom and cheese omelette. One of my favorites with eggs is bread pudding! My family loves it! My favorite egg recipe is egg and olive sandwich spread, my Mom made it for us growing up and it’s great on wonder bread. we love Egg Salad Sandwhiches. People love my Deviled Eggs!!! I use spicy mustard and pour a little pickle juice in with the yolks, mayonnaise, mustard mixture! One of my favorite things to make with eggs is a Western Omelet. I make Cheese Omelets. My husband loves them. We love omelets! I also like deviled eggs and egg salad. I love to make bacon Egg cheese and hash brown casserole. I like to make an egg sandwiches on a bagel with cheese and bacon. Love devil eggs with crab meat. We love all egg recipes at our house! Scrambled, deviled, poached, we’ll take them all. My favorite would be bacon and cheese omelets. Yum Thank you! I make a homemade egg sandwich on an English muffin-very good! Honestly, deviled egg recipes are my favorite egg recipe variety. I love deviled with salt and pepper added. I love egg casseroles with either bacon or sausage for brunch. My favorite recipes with eggs would be deviled eggs. Thanks for the giveaway! I like all kinds of omelets – breakfast, lunch or dinner. One of my favorite egg recipes is hashbrown casserole with eggs and sausage! I like to make ham and cheese omelets. I just love ham and cheese omlets. Deviled eggs are my favorite to take to events. I have to try them with pimiento cheese. I love omelets with peppers and onions! I always make deviled eggs and dress them up with pieces of olive to look like little devil faces for my grandchildren! I love deviled eggs made with miracle whip, yellow mustard. I love everything with eggs, deviled eggs, omelets, eggs, but my favorite would have to be potato salad. I love making homemade egg noodles with fresh eggs! They just taste so good! One of my favorite recipe with eggs is simply a breakfast burrito with scrambled eggs mixed with cheese! I love them! I like eggs in a breakfast casserole consisting of bread, cheese, bacon, and of course the eggs. I am an egg salad sandwich FIEND, love it so much, could eat it every day. We eat a lot of eggs for breakfast and enjoy them scrambled with cheese. I love Eggs Benedict… soooo good! We make more deviled eggs than anything else but my second favorite egg recipe would be omelettes! Lots of cheese, ham and mushrooms for me please!